I used to show number 76 but now I've passed it by. Maybe I should get a 96 and see if that works. 1971. 6 years after the car and 22 years after the 8N tractor. Sailing Jazzman from Catalina Island with the kids. Loading the Continental for a show. I sold the car in 1973, in Tucson, Arizona to buy a mobile home. Missed it for 40 years. In 2013 I found it again, bought it back, and I feel like I just won the biggest lottery prize ever! I really think the car found me and wanted to come back to me again. Funny how life can be! I am rebuilding a 1965-C motor which will be balanced and blue printed. It should be over 100 hp, and then I will be driving this car as much as I can. 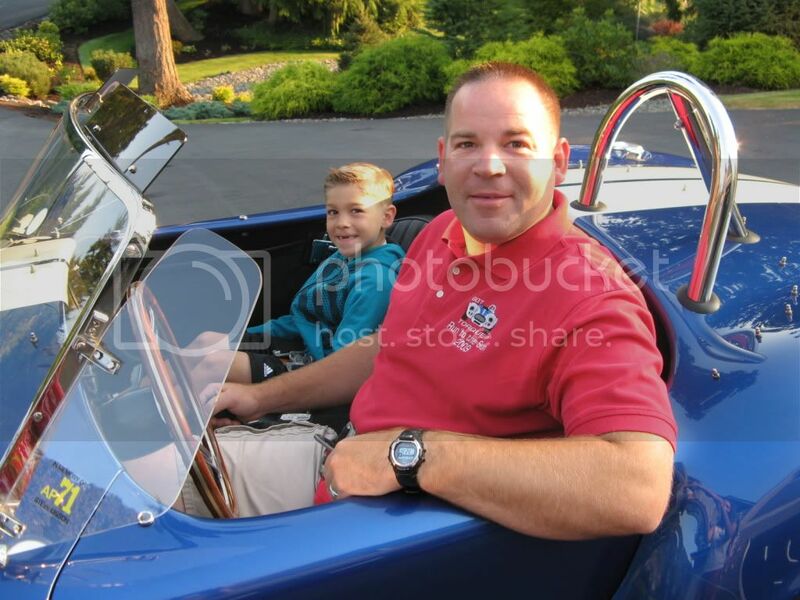 I can hardly wait for my first drive in the spring of 2014, it will be very, very special. Now at age 62, I have a lot of time to make up with my good old friend, Carmine, and she only has 128K miles logged so far in 53 years. Last edited by steverestelli on Thu Apr 03, 2014 12:29 am, edited 1 time in total. 1990. Guess I must be one of the youngest ones here. I was born in 1936, got interested in sports cars after I saw a young Korean-War vet who was a customer of my parent's grocery store with an MG -TD-very cool. I owned an MG, then Austin-Healey 100M, but then I saw a 1958 Porsche Coupe, special orange color, all leather, chrome wheels,radio, Super engine sit for weeks at Pete Lovely's Sports Car Center. Traded the A-H for what I paid for it new. The Porsche was a fantastic car which I owned until 1964. It was a revelation after the A-H. I'm sure it had one of Porsche's occasional engines with more power. I made many trips to California and had it at 6,000 rpm-120mph several times and it would idle smoothly at 500rpm. I had a friend with a 1957 Carrera Coupe and it would usually keep up with his car. Sold it in February of 1964 to go to Europe for 6 months with my new wife. Tried to buy a new VW but only way to get a new one was to order one, make a down payment and wait. When they kept delaying delivery we demanded our down payment be returned which they reluctantly did. So we looked for a used Porsche instead but they were rare because the Germans couldn't afford them. We went to several cities, the Porsche dealers, looked in newspapers with no luck. Finally we decided to go to the source- the Porsche factory. We walked in the door, asked about used Porsches, a man came out, took us across the street where we waited until he came out of an underground garage with a 1960 Super 90 coupe, Ruby Red, sunroof, leather, radio, etc. which we bought for about what we sold my 1958 Porsche for in Seattle. Then he took us on a private tour of the Porsche factory. This was early May of 1964. We camped all over Europe with this car but sold it to a GI in Munich in September and didn't ship it home. I have no info about this car except many pictures and sometimes wonder if it made it to the states and still exists. Now I own a 1958 Super Coupe, almost a clone of my first Porsche, close in VIN and engine number, probably made the same week. I am 41 and keep racing, mainly on Porsche. The 356 is only for cruising the WE. Just finished my 50th year of racing 356s. Born in 1963. 51 yrs of playing with 356's, 35 yrs of owning 356's, and 26 yrs of racing 356's. Born in 1946, so I went through that glorious period of European and British sports cars igniting the spark of spirited driving in something other than a straight line. Read Tom Cahill and others who were extolling the virtues of 'sports cars' as opposed to bloated sedans. High school was a time of Bugeye Sprites, MGAs, TR3s, Healeys and Porsche 356s. It was a great era in which to be a youngster yearning for the car of his dreams. What I ended up with was a beaten up Bugeye, which I drove in all seasons with low oil pressure, no heater, and bald tires. Fun like that is hard to come by these days.